The grape vine is very similar to the human species; it grows and matures in stages, it produces fruit of various qualities (depending on how it's treated and the habitat that surrounds it), it grows old and wise and produces less but more concentrated fruit. The grape vine produces dense and beautiful fruit when it is put under stress. The hard working and stressed out vine is forced to dig deep and build strong roots and will produce better fruit than the vines that have everything handed to them and live in the fertile soils. 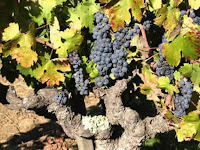 These spoiled little vines have shallow roots and produce lots of grapes but lack the concentration, depth, and interest found in the fruit of the stressed and dynamically challenged vines. As the vine matures it's crop yield decreases, but miraculously the vine then uses all it's energy to produce a more focused and true expression of it's life's work. Eventually the vine will die but it leaves behind it's legacy and then new vines are planted in it's place. Those who tend the newly planted vines will use their knowledge and what they have learned with the past vineyard, to start a new journey and make equally interesting and beautiful creations.